and why we have them. 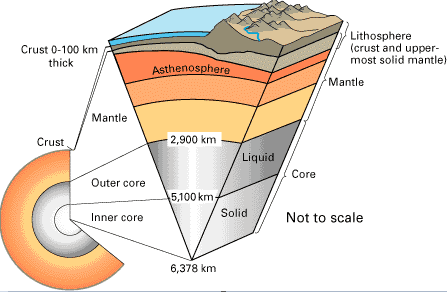 The Lithosphere (litho means rock) sphere contains the crust and upper portions of the upper most mantle. It is about 80 km thick on average - or 1.25% of the radius of the earth. The interior of the earth is dimensionally similar to the dimensions of an egg. The yolk being the core and the crust being the shell. The shell, which is very thin and brittle is similar to how the crust behaves under similar forces. The Moho is considered to be the boundary between the crust and the mantle where the P waves speed up from 6 km to 8 km. Earthquakes occur because of plate tectonics. 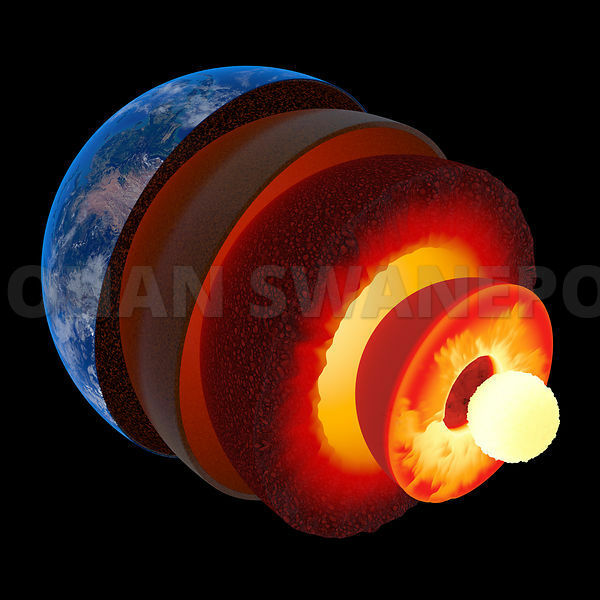 The theory of plate tectonics is based on the idea that the crust of the earth is sitting on top of a floating mantle of magma. Earthquakes, volcanoes, mountains, trenches and mid ocean ridges are created because of the movement of the broken up crust - also known as tectonic plates. 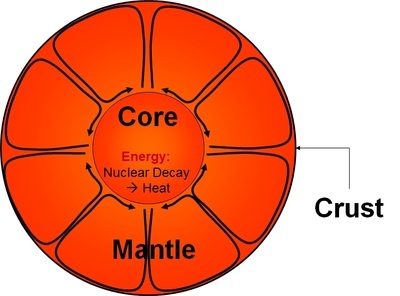 These features are created because of the earths internal heat energy found in the core (through radioactive decay) which then creates convection currents throughout the mantle. The oceanic crust is an extension of the mantle - but in a more solid state. The continental crusts are similar to the scum found from processing iron and are less dense to the liquid iron below. 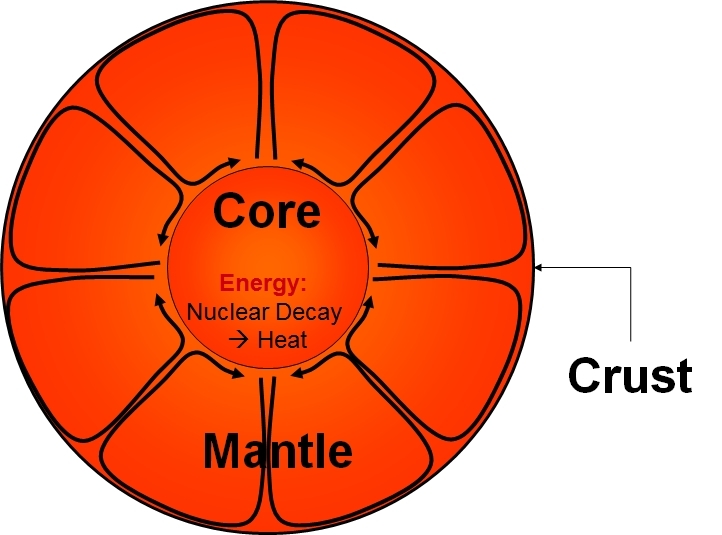 The liquid rock - aka the mantle - get's its heat from the core at the center of the earth through nuclear decay. That heat is then transferred through the mantle through convection. At the top of the convection cell, the liquid rock cools down to a solid state before coming back down towards the core. Along with it, it moves the crust above. Anytime the crust moves, it rubs against an adjacent piece of crust (aka - tectonic plate). That rubbing snaps and vibrates. 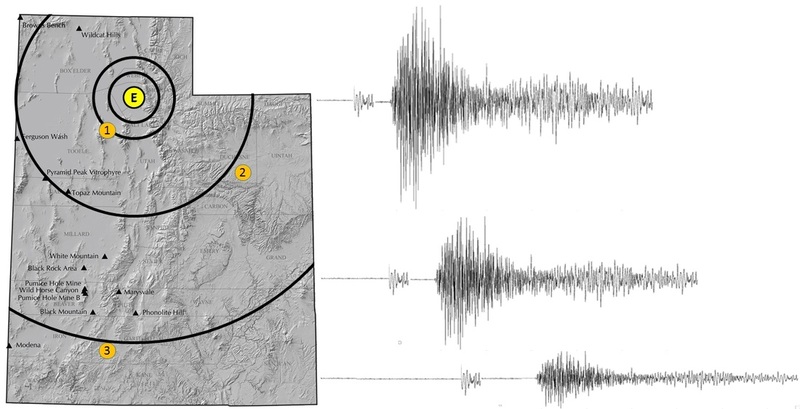 This snap and vibration is what we commonly call an earthquake. Sometimes pieces of crust collide towards each other. This causes the frontal parts of the colliding plates to buckle - this forms mountainous terrains - depending on what types of crust (oceanic or continental) are colliding together. Before an earthquake happens, the magma deep below builds up tension along the surface between the two plates that are held together. Friction is the force that is keeping it together. When there is enough tension to overcome the friction, an earthquake occures and the fault ruptures - which allows the sides of each plate to move relative to each other. Where the plates interact - we have plate boundaries. At the plate boundaries - it is true that we have faults. But faults can also happen further away from the plate boundary - so let's determine the difference between the two. 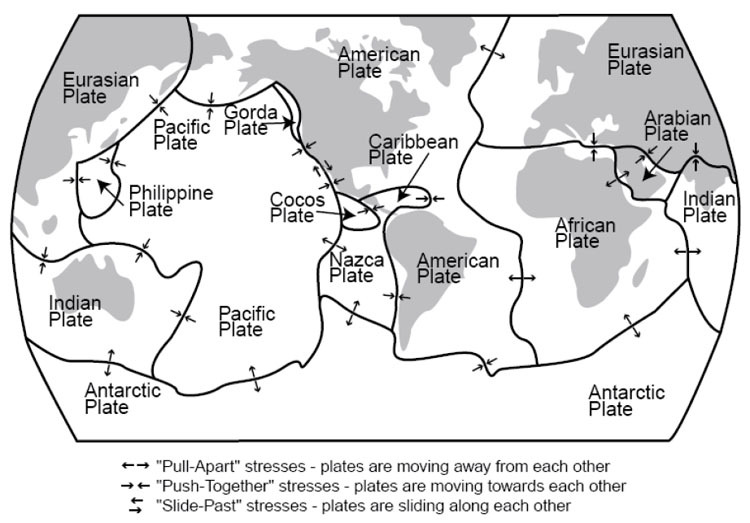 Plate boundaries are determined by the interaction between two plates. 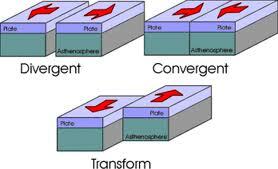 These plates are either moving away from each other (divergent plate boundaries), or towards each other (convergent plate boundaries) - where they slam into each other - and lastly plates where they slide past one another (transform plate boundaries). The major faults lie on plate boundaries between plates. 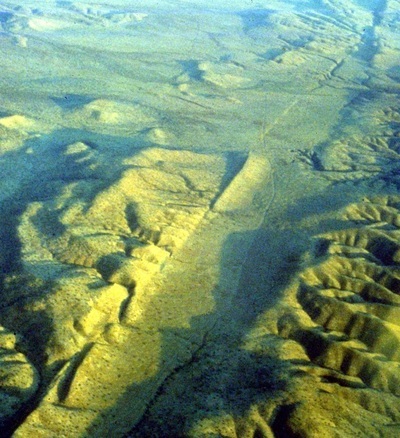 However, many faults can still form near and far from the plate boundary - such as the Wasatch Fault, or any other fault that is a spin off of the San Andreas fault in California. As shown here, Japan is experiencing many earthquakes that are not along the plate boundary that is shown dipping downwards. The shallow earthquakes that are happening at or to the sides of Japan indicate faulting due to regional compression - as the Pacific Plate moves towards Japan and as Japan moves towards the Pacific Plate. Click here to find out why the Pacific Plate is sub-ducting. A model that shows what happens when a fault forms due to the compressional forces from above and below which squeeze the rock and breaks it. A reverse fault, much like the faults that formed most of Japan (not the plate boundary) forms when compressional forces squeeze the two blocks - that result in breaking the rock forming a fault. Normal faults, like the Wasatch Fault, happen when tension pulls at the blocks and breaks the rock forming the fault. 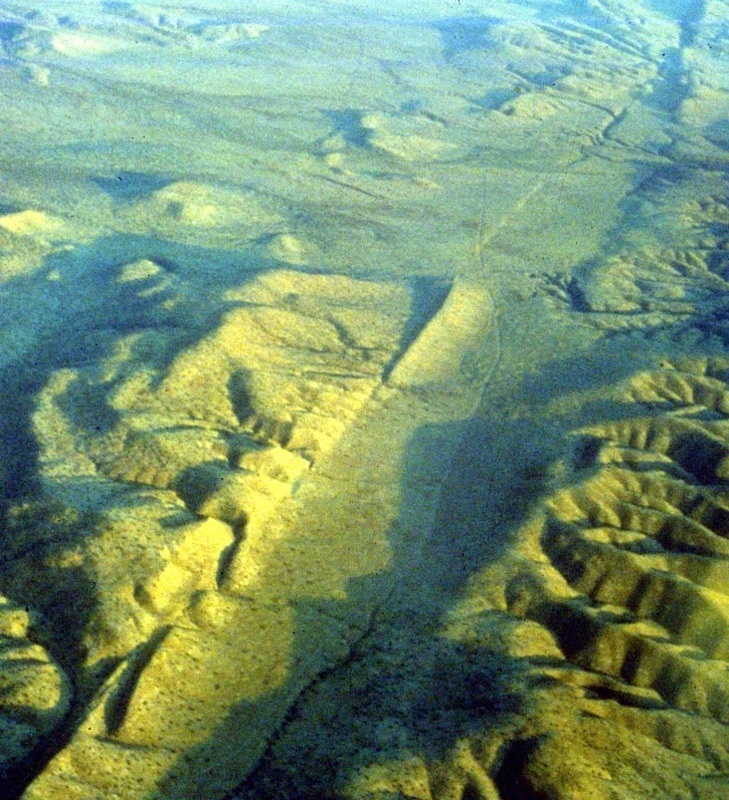 A strike slip fault, like the San Andreas fault (which is a plate boundary) moves to the side relative to the other block instead of up and down. Faulting happens because of several forces at play. Those forces also relate to energy. In order for an earthquake to occur, tensional and compressional forces must overcome frictional forces and the rocks rigidity - (or material strength). In this video - notice how he describes how stress (tension and compression) must overcome frictional resistance in order to get an Earthquake. Also notice the blue region which is relaxed - low stress, and the red regions that are high stress. Also note that when an earthquake occurs, the fault is ripped - in this case, the fault ripped up to 75 miles, and ripped at a speed of 5000 mph. That's a very fast rip! I n class, I explain how this is very similar to a windshield crack and snapping your fingers. Notice in this video - that once the area that is relieved, it puts more stress on adjacent areas that have not snapped yet. This is where future earthquakes occurred - much like a windshield crack happens in spurts instead of all at once. 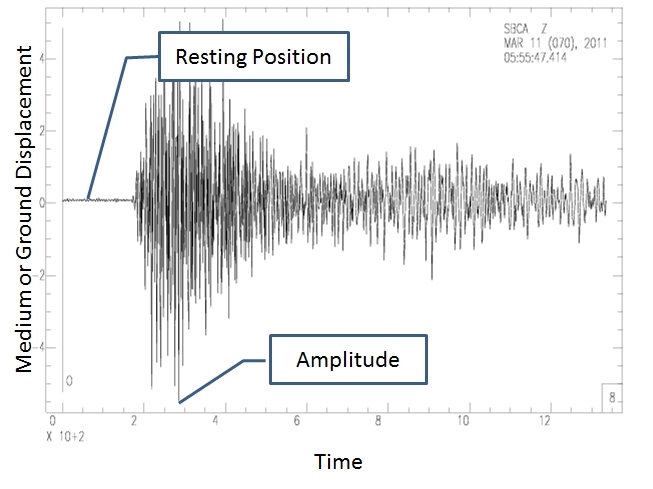 Once an earthquake occurres, seismic waves are generated. 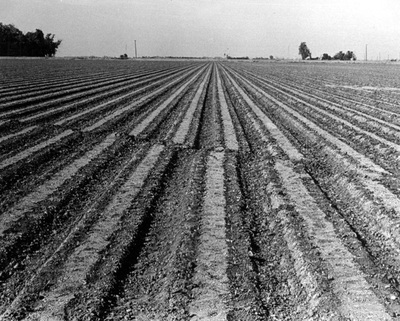 Just like sound waves going through a medium, the ground moves both up and down, back and forth and side to side. Generally speaking, we have three seismographs at any location to pick up the three different directions. In the old way of calculating magnitude, the height of the amplitude of the wave (up & down portion of the squiggly line) showed how large the earthquake was. Now they use more variables in their calculations. But, if in a perfect world, the further you move from the hypo-center, the wave gets less intense - much like the sound is very intense when you are near a loud speaker, and softer the further you move away from the speaker. This helps to explain why station 1 might experience higher amplitudes and 3 diminished amplitudes. 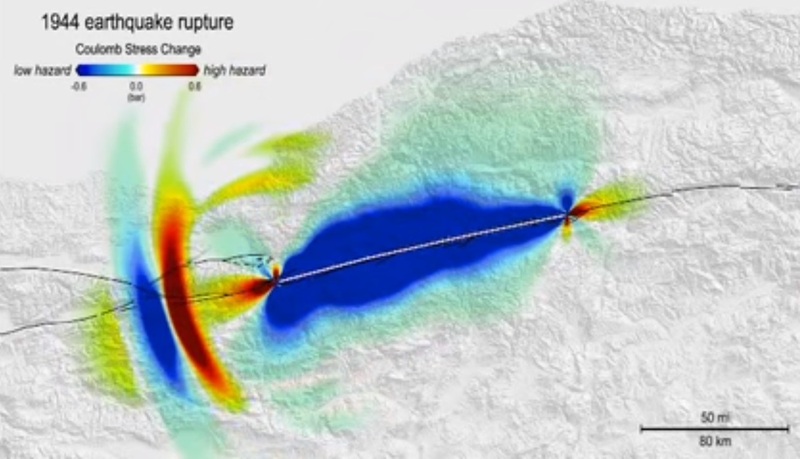 Below are video samples of how a wave might propogate throughout the world after an earthquake occurs. 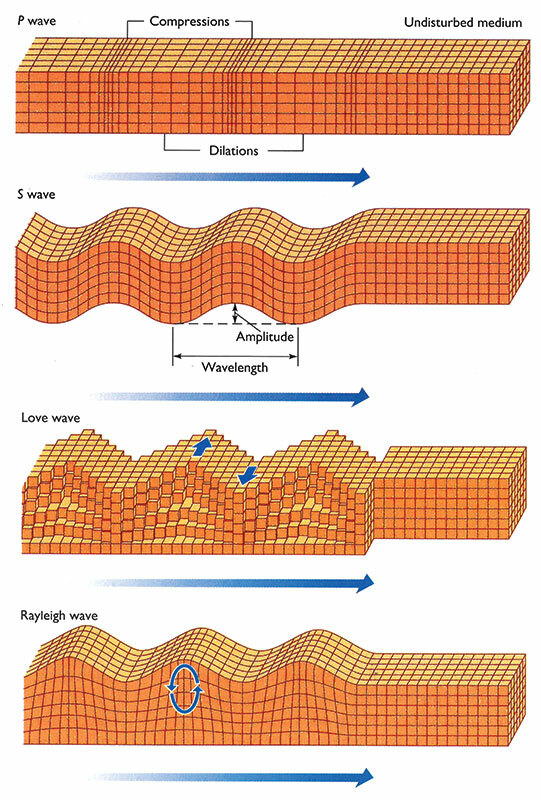 Basically, there are two different types of body waves - or waves that travel through material, and two surface waves - or waves that travel only on the surface. Notice in this video how compressional forces of the Pacific Plate are pushing the overlying continental plate (i.e. like Japan). This pushing and subducting must overcome the frictional forces between the two. 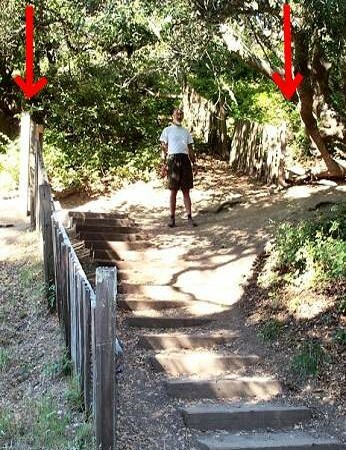 Once compression exceeds friction, slip happens and the water above is thrusted upwards - causing a huge wave to move outwards. This is how Japan's Tsunami was created. Why predicting is so difficult. When an earthquake happens, the land moves is small short bursts. Each time the crust moves due to the mantle moving below, when the crust above breaks and moves, that rumbling we call an earthquake. A part of Japan, after its last earthquake, moved 8-12 ft eastward. If we were to view it from a distance - it wouldn't look like a lot of movement in a global perspective. 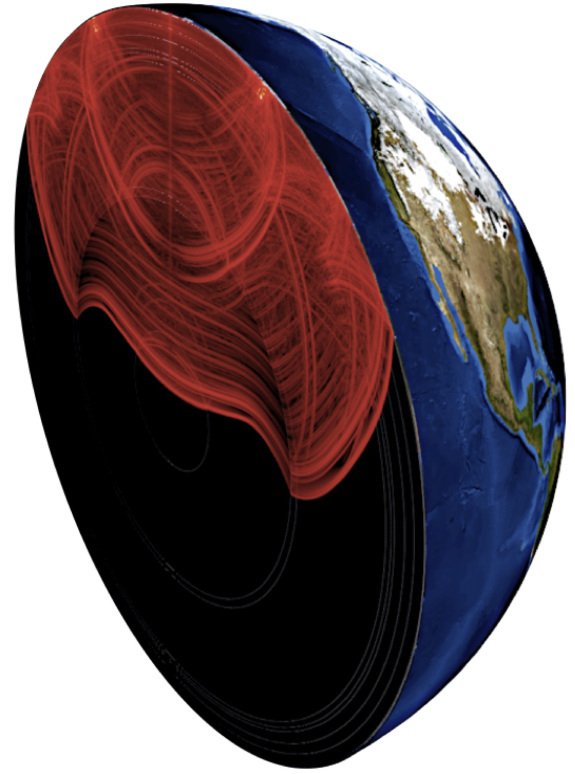 However, if over the course of millions of years of earthquakes, you might see gradual fluid like motion of the plates and continents moving, like the animations show above. PBS video on Plate Tectonics, "When plates collide" shows a great animation of what happens deep below.